Experiment with modifying the query details without losing the original query. Share a copy of the query with team members in a different workspace. 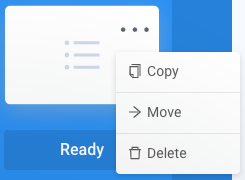 Hover over the query you want to copy. Select the options menu for the query you want to copy. The options menu is represented by ellipses (...). Choose the workspace to host the copy in. A copy of the query is now hosted in the chosen workspace. You can move a query to any of your other workspaces. Hover over the query you want to move. Select the options menu for the query you want to move. The options menu is represented by ellipses (...). Choose the new workspace to host the query in. The query is now hosted in the chosen workspace.